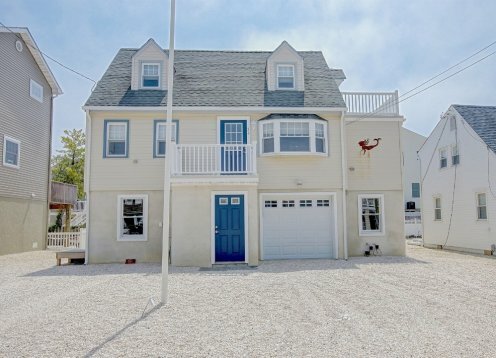 LBI Ocean-front 3BR totally modern house in great location! Recent build, 3 BR, 2 bath with modern open kitchen and great room with TV. Master BR has TV, queen bed and on suite bath and access to ocean front deck. Perfect location for your family! Perfect location for family! Short walk to the beach and the grocery store in 30 seconds! Located across the street from the best ice cream on the island! A Relaxing Long Beach Island Vacation Awaits You! LBI has all of the vacation activities you’re looking for. It also offers a full range of dining options and night time activities. Family friendly beach house that sleeps 10! 9 houses from the beach! Welcome to 3. E Seabreeze Ave, a unique two-unit duplex that's available as a single family residence. Plenty of room for extended families. Discounted Rates June and September! Come and enjoy our wonderful LBI vacation home. A memorable vacation awaits families at this ideal location. Panoramic Bay Views,single family home, 2 new decks overlooking bay,w/sandy bay beach. Pet friendly, Central a/c,4 bedrooms, 2 full baths,ground floor play rm!